Sometimes we get so caught up with all the news coming out of the White House that we lose track of what is really important. How weird this administration is. Take for example this story originally published by Time. The president recently invited journalists over for dinner which sounds like a nice thing to do but the evening turned into a strange power play. Trump got a soda, while everyone else was left with water. He got more and better dressing than his guests. He's notorious for being very, very particular and some of his habits have been labled as very strange by people who have spent a lot of time with the President. For instance, he's one to always eat McDonald's at least a few times a week and always starts his day by watching the news in bed before getting up. People have theorized many of his early morning twitter rants have spawn as he rages at the latest news on CNN talking about his wrong doings, or as he'd call it, Fake News reports from the MSM. 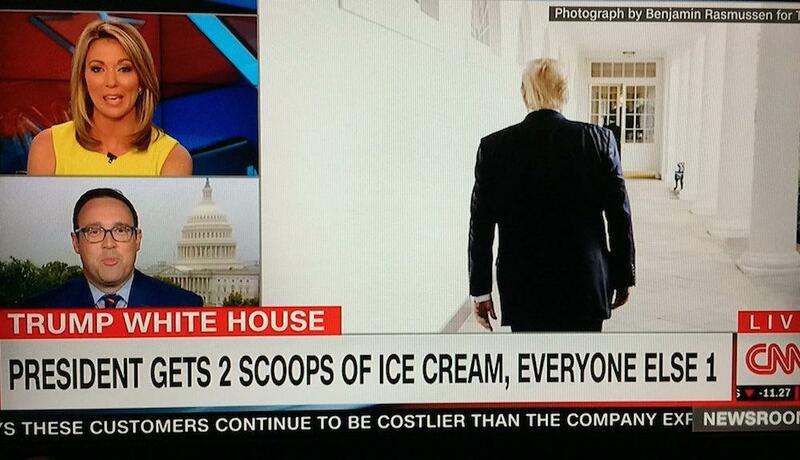 The most bizarre thing though is that at the end of it all he got two scoops of ice cream, whereas everyone else one got one. I was going to make a joke about how he sounds like a kid at his own birthday party but I don't even think I've heard this happening at kids' birthday parties. This is unheard of. "I'm gonna make the best ice cream ever," he screams with his last breath before drowning. "Everyone loves Trump Ice Cream, it's tremendous"
oh my, the Trump ice cream thing is actually true? And, look, I know there are more important stories out there, but you have to admit this is weird, right? We guess The Donald always gets what The Donald wants and if that means two scoops of ice cream for the big boy, then that means TWO scoops of ice cream. No questions asked!